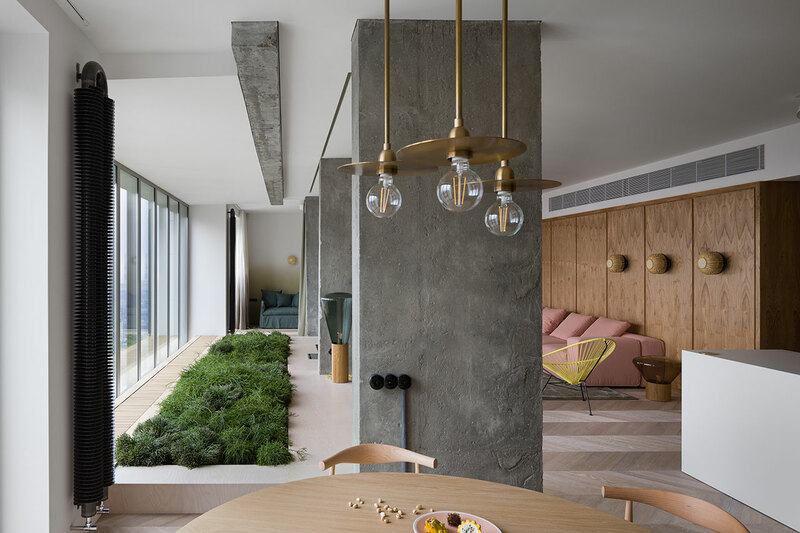 Located on the 28th floor of a residential tower in Kiev, Ukraine, this newly renovated apartment by local interior designer Olha Wood combines a modernist aesthetic of sleek, clean lines with a soft palette of warm timber hues and pastel colours. 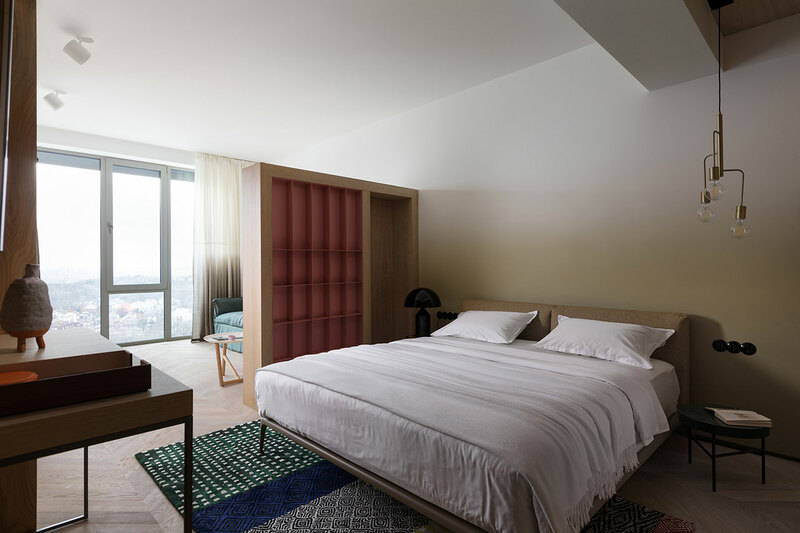 Complemented by an “indoor garden”, the elegant interiors of romantic minimalism are the perfect backdrop to the panoramic views of the city. 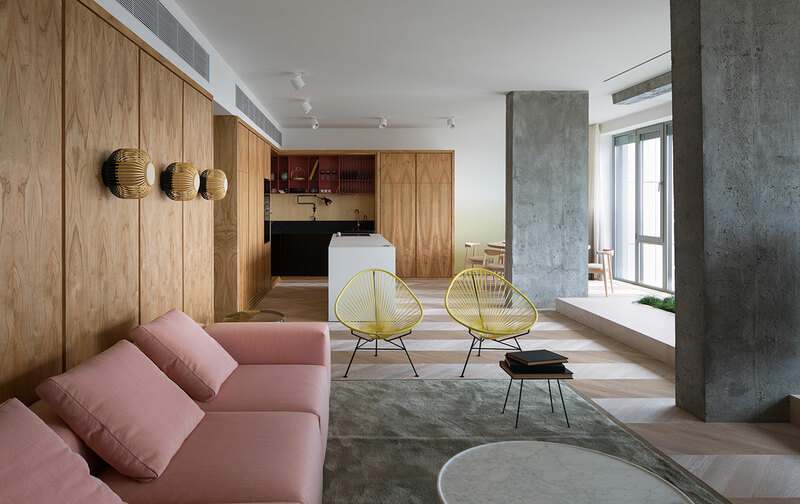 Since the property has a single occupant, Wood has designed an open-plan layout where each space seamlessly flows into the next, with the front part of the apartment being reserved for the living areas, which sequentially unfolds along the length of the glazed facade, whereas the private quarters are pushed to the back. 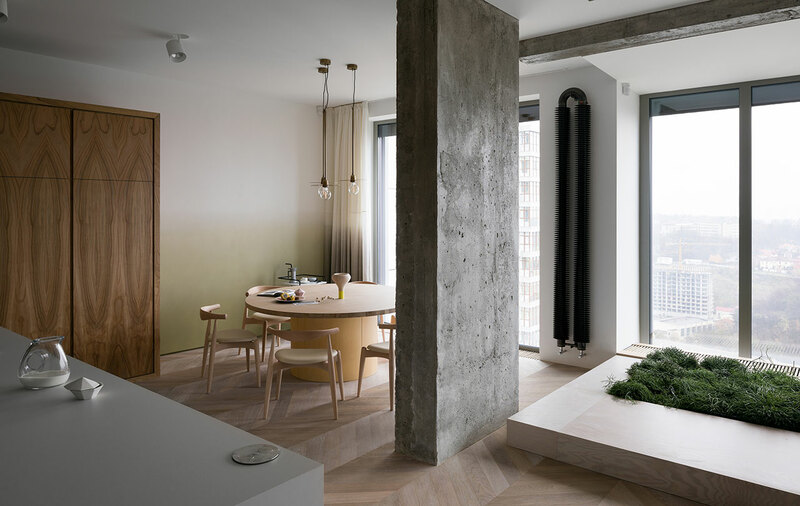 This allows for the owner and her guests to enjoy the sweeping views of Kiev’s skyline while lounging, cooking or dining, while the privacy of her more intimate moments is secured. 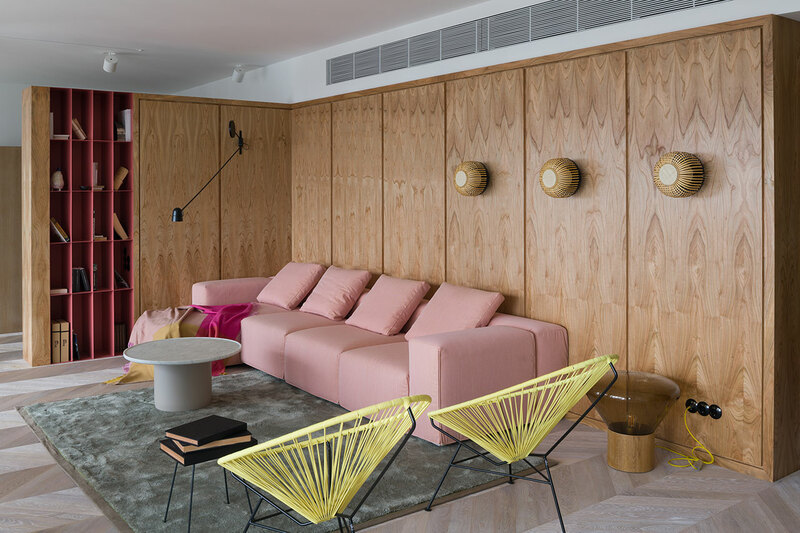 The interior décor has been poetically conceived as a subtle play of subdued patterns and soft colours. 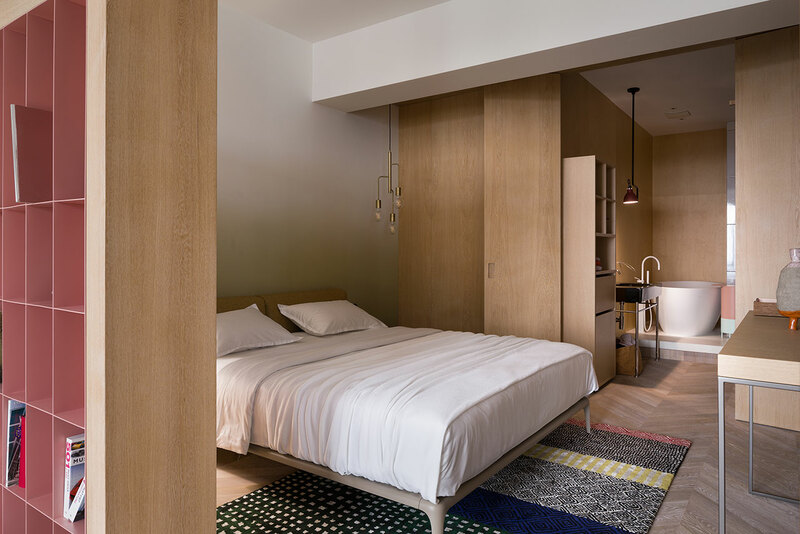 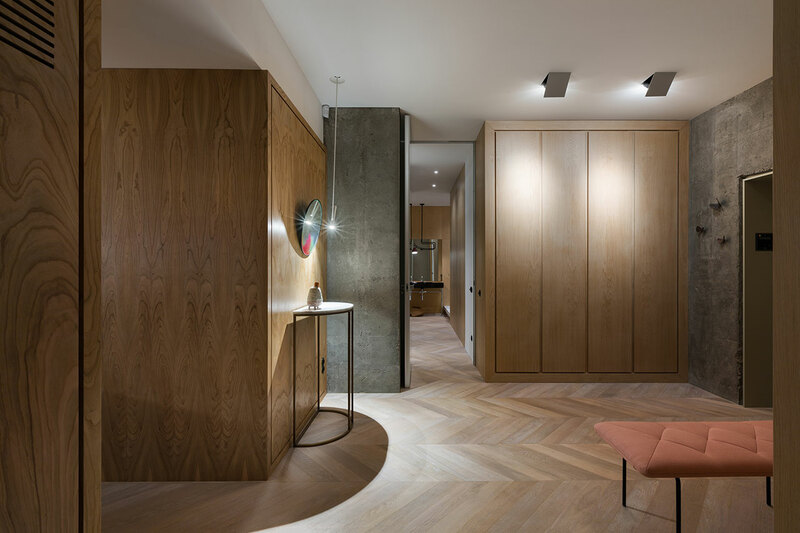 Setting the tone, the designer has chosen oak for the herringbone parquet flooring and cherry wood for the wall panelling that warmly embrace the living space. 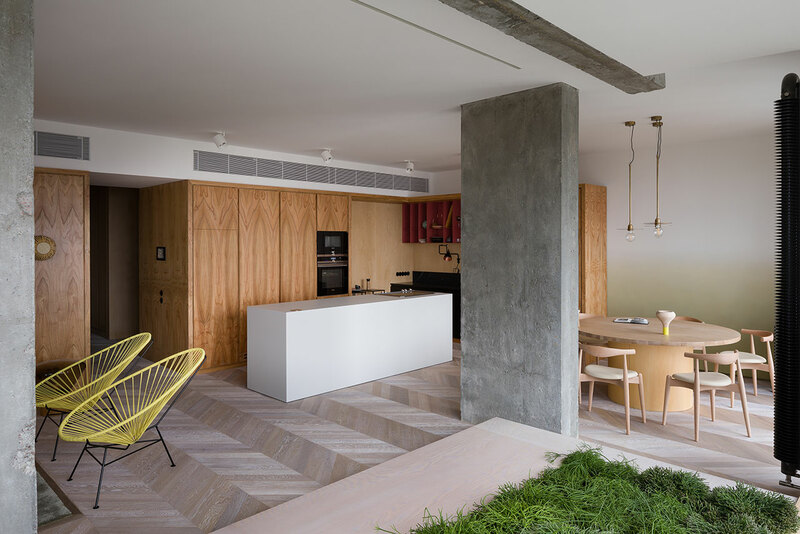 This soft timber backdrop is perfectly complemented by the exposed concrete pillars and the lush green vegetation that has been planted in front of the windows. 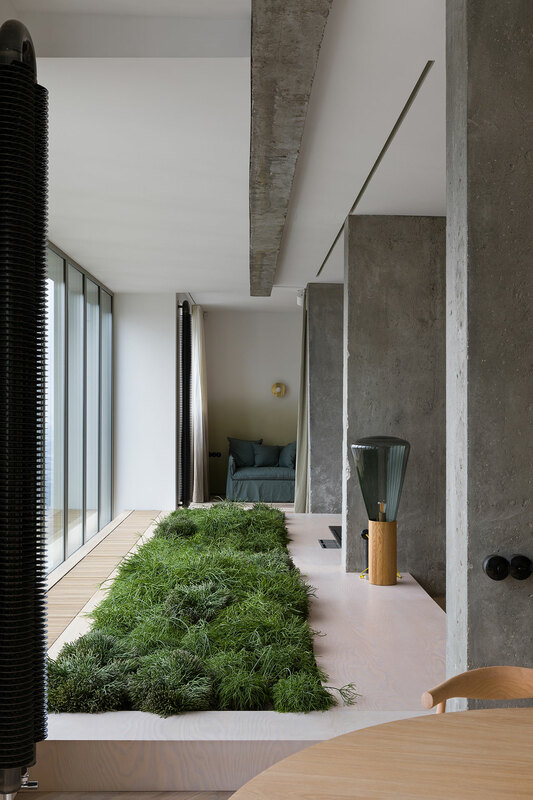 Seen against the expansive views of the sky, the grassed area forms a sort of floating indoor garden. 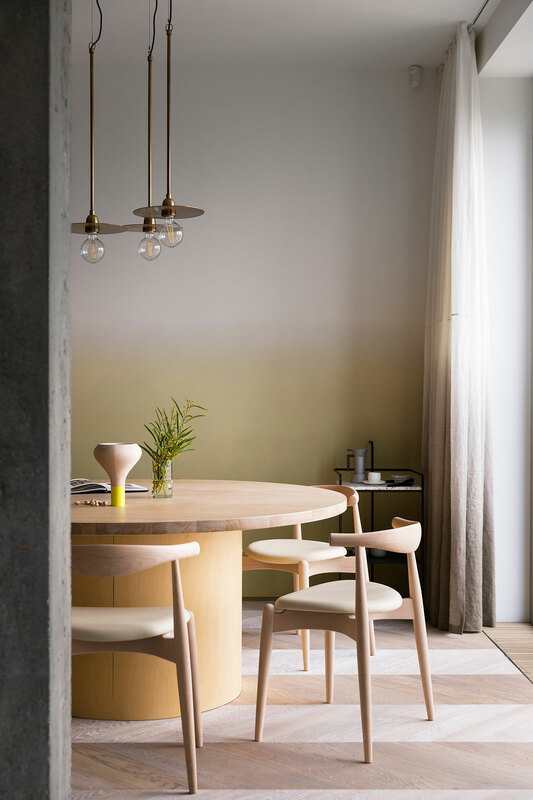 This lyrical sense is further enhanced by the soft gradient, white to ochre to grey, on the lateral walls and on the curtains. 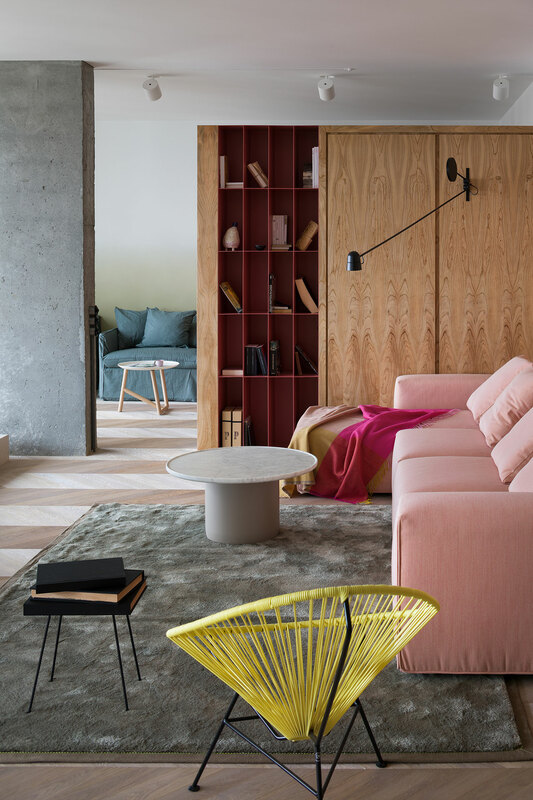 The natural hues harmoniously coexist with splashes of pastel colours, predominantly in pink, which grace a comfortable Moroso sofa, several built-in book cases and cabinets, and other furnishings throughout the flat, as well as a bluish green, featured on two Gervasoni armchairs that double as sofa beds for guests, and yellow, featured on two egg-shaped Acapulco chairs. 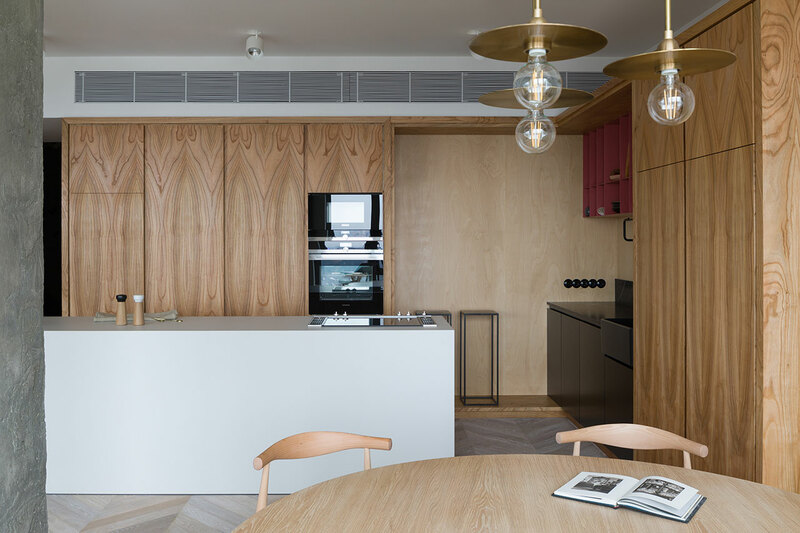 The living space is completed by a white Bulthaup kitchen island and a circular dining table of blond wood. 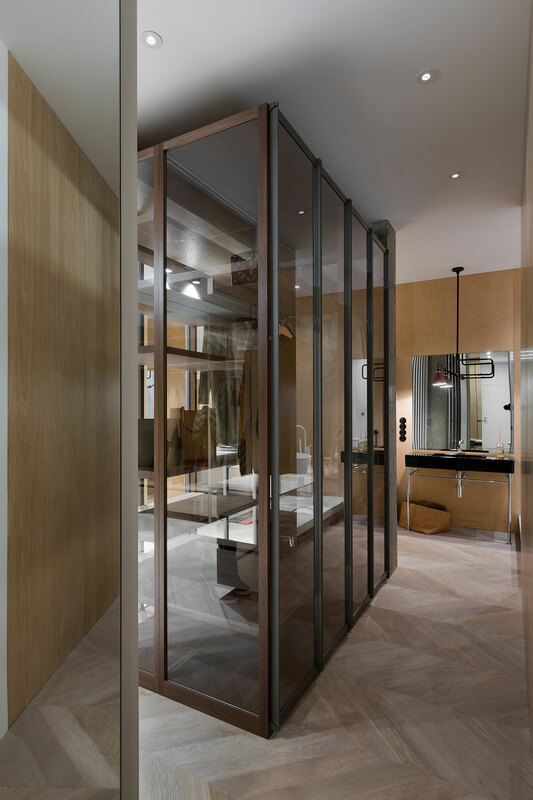 The private quarters at the back of the apartment, comprised of a bedroom, bathroom and dressing room—the latter conceived as a transparent enclosure courtesy of Poliform’s Ego, a glass wardrobe designed by Giuseppe Bavuso—form a spatial continuum that can be seamlessly compartmentalized if required. 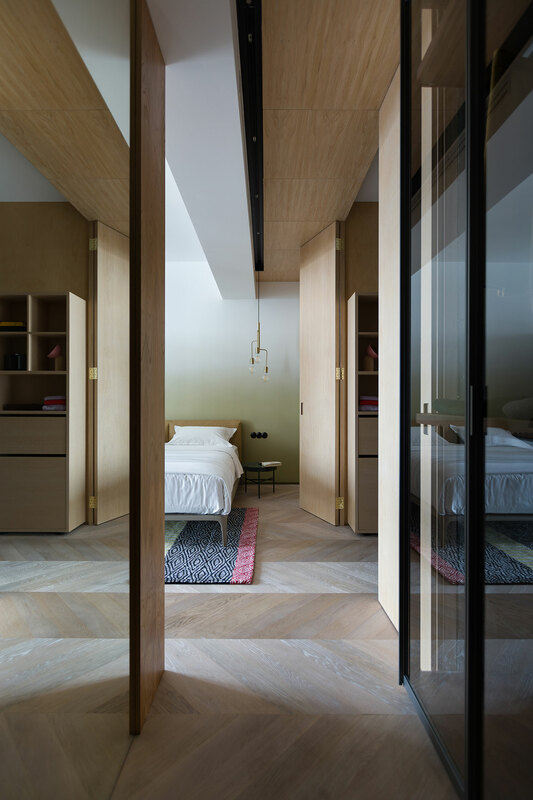 Similarly to the living areas, wood has been extensively used in these spaces which see oak floorboards as before, plywood panelling and oak partitions, as well as a complementary furniture selection. 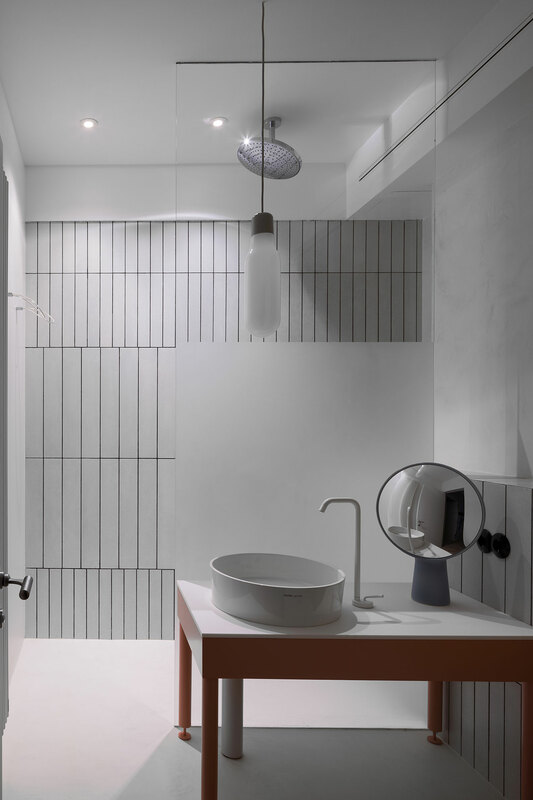 The warmness of the wooden elements is refreshingly juxtaposed with the cool starkness of the white Made a Mano wall tiles that form a streaked grid in the open shower area. 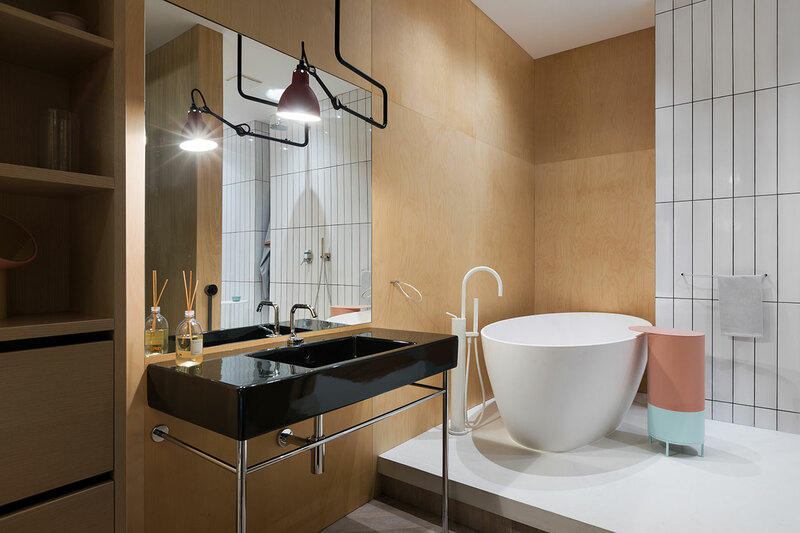 Although minimalist in aesthetic, the designer has added several discrete features that personalize and animate the space such as a colourful carpet from Designers Guild, small glass vases on the walls and a pink and white bathtub side table, named KEG, which was designed by Olha Wood for this project and is now available for purchase from the Estonian furniture designer PLAII. 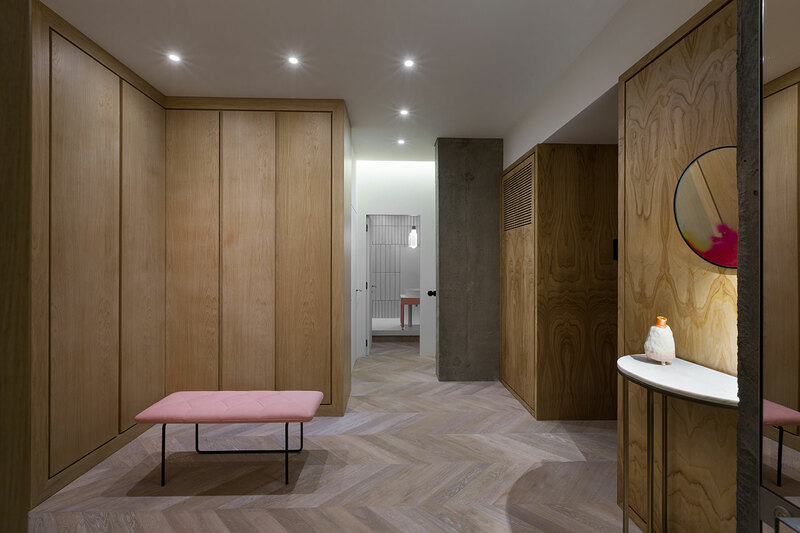 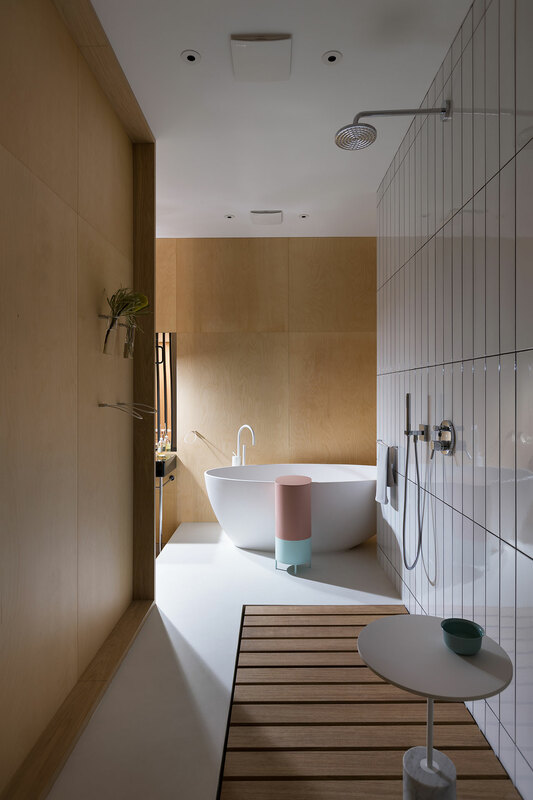 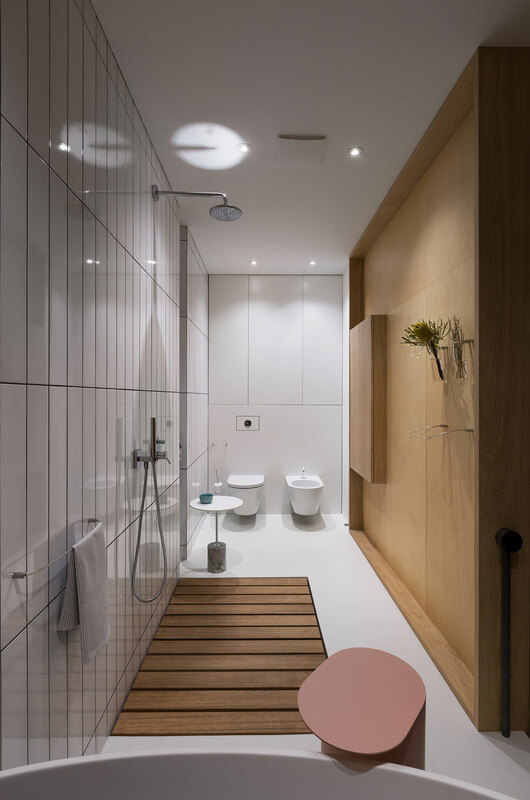 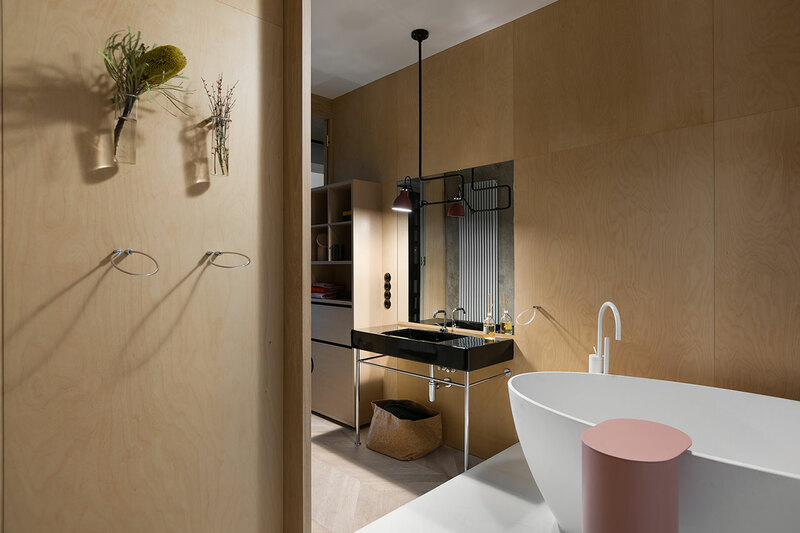 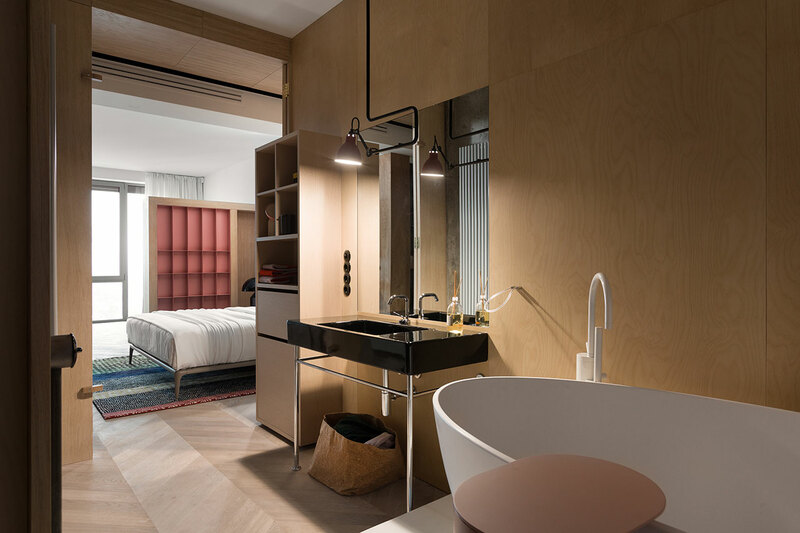 An entry hallway and a guest bathroom, designed with the same aesthetic sensibility, further complete the layout of this elegant apartment of gentle modernism.